There’s no need for greed. From a glass of pure gold. Bearing all of your dreams. I might go nuts too. The romantic comedy hasn’t gotten much love since the 1990s, has it? After the heyday of Nora Ephron, it’s languished in clichés (just look at the recent parody Isn’t It Romantic? ), and even the good ones (Elizabethtown, Music and Lyrics) have rarely enjoyed both critical and commercial success. In 2017, The Big Sick seemed to buck that trend, but Crazy Rich Asians really breathed new life into the clichés and broke some barriers along the way, though it may be too soon to say it’s revived the genre in a lasting way. Constance Wu plays NYU professor Rachel Chu, whose boyfriend Nick (Henry Golding) invites her to a hometown friend’s wedding back in Singapore, where she soon finds out that she’s dating the most coveted bachelor in the country and heir to a huge fortune. While that would normally be a dream come true, she is faced with the hurdles of both jealous rivals and Nick’s judgmental mother Eleanor (Michelle Yeoh), along with a host of extended family members to navigate. The core plot of Crazy Rich Asians isn’t all that revolutionary, but it features plenty of opulent visuals and good humor delivered by its all-Asian cast, making up for Hollywood’s limited Asian representation with one huge and lavish ethnic crowd-pleaser. At the same time, it weaves in some unique and subtle themes, particularly involving Yeoh in disapproving mother mode; you don’t often see examples of cultural prejudice, which is apparently more prevalent outside the U.S., where everything has become about race lately. Nick’s mother and Rachel are both ethnically Chinese, but Rachel’s American upbringing makes her selfish and unworthy in Eleanor’s eyes, a conflict that is beautifully resolved with some excellent acting between Wu and Yeoh. While Crazy Rich Asians has many merits and many advocates to praise them, it does falter at times. Despite the best efforts of Ken Jeong and Awkwafina, there aren’t enough laughs for the comedy side of things, and the splendor of the wealthy Singaporeans sometimes went annoyingly over-the-top, which was probably the point considering the film’s title. Back when I reviewed The Philadelphia Story, I had to disagree with Jimmy Stewart’s line “The prettiest sight in this fine pretty world is the privileged class enjoying its privileges.” The same holds true here. 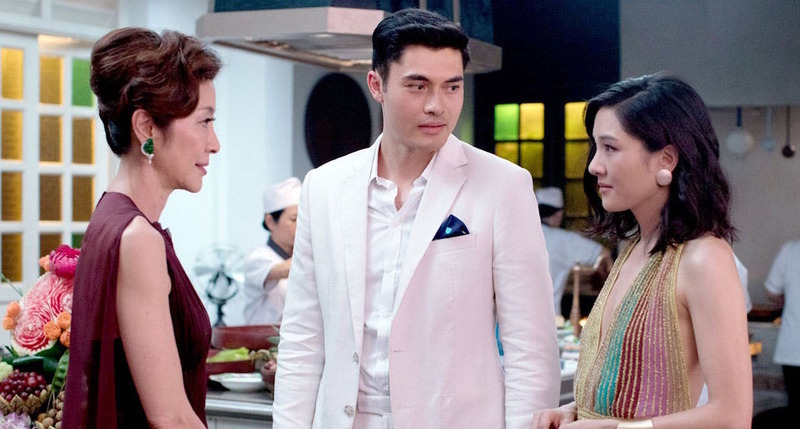 The lifestyles of the rich and famous can become insufferable with excess, and Crazy Rich Asians features that same irritating materialism, including the strangest wedding ceremony I think I’ve ever seen, at least as far as set design (though the film does incorporate other positive elements, such as Eleanor’s Christian faith). Negatives aside, Crazy Rich Asians manages to live up to its name and to the more favorable side of its genre. As a fan of good romantic comedies, I’m glad that it was so wildly successful and hope that other unique and well-made rom coms will follow in its wake.